SAVE BIG (up to 35%) when you order calendars before July 1st! These economical 12 month mini-calendars deliver great advertising value. Make the smart choice and put your message on a long-lasting mini. Let 12 full-color pictures on glossy paper stock call attention to your ad for 365 days. Corresponding envelopes or polybags also available. Imprint Size for Both: 9" x 1 3/8"
Includes US interstate highway maps, area code reference, mileage charts and more. 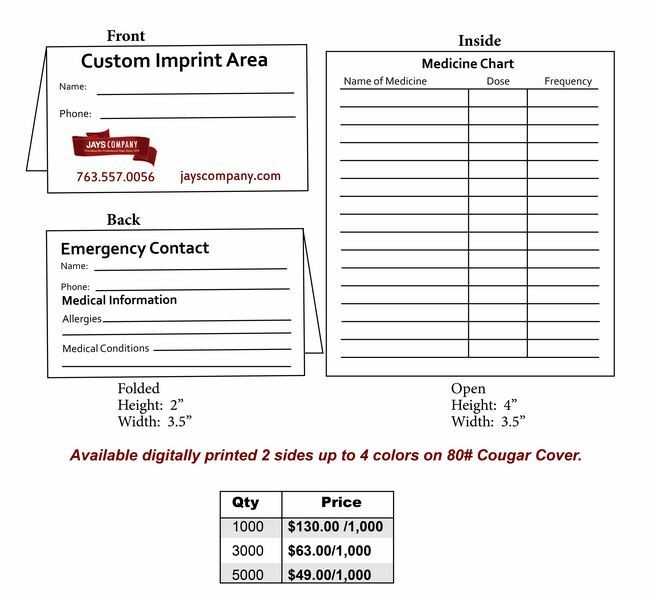 Size: 3 ½" x 6"
Print your logo and message on the front side of handy wallet cards. Choices include: 12-Month Calendar in black and white, 4-color 12-Month Calendar, Tipping Table, Emergency Contacts/Allergies/Medical Conditions, and Medication Chart. Size: 3 ½" x 2"
Imprint Color: Black is standard but also available in one, two color and full color process.